TCMF provides THREE happy hours a night at Central Market this week! Austin — The Tenth Annual Texas Community Music Festival kicked off five straight weeknight performances Monday, with the kind of diverse musical program that’s become the hallmark of “the greatest little music festival nobody’s ever heard of…” OK, that’s what some call it. There have been tens of thousands of grateful music lovers who might disagree with that title. Monday’s show made more converts out at Central Market North, as the program kicked off with the Westbank Jazz Ensemble, which also represented one of TCMF’s strongest Community Supporters, the Westbank String Shop and exposed everybody to the flute and vocal styling of our own Todd Sloan, Geof Sloan, Bob Sloan (yeah, they’re related…) and Tommy Williams. Next up were the Gabacha-chas, who took the dinner time audience on a fun and musical tour of Latin American music. It was the fourth year of participation in TCMF for this intrepid group of musical travelers. The evening came to a rocking climax with the first ever appearance by Bubba Coletrane and the Train Wrecks, who added some horn-powered, straight ahead, top to bottom rock to the evening’s entertainment. 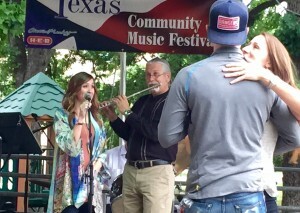 Jazz, Latin, Rock … just another night at the Tenth Annual Texas Community Music Festival! The festival continues Tuesday at 5:30 with the Violet Crown Flute Choir, a “child” of the festival’s founding group, the Austin Civic Wind Ensemble. The evening continues with two of the handful of ensembles who have played at every single TCMF since year 1: The Austin Polka Band, followed by the Chaparral Dixielanders. It will be an evening of traditional music and more TCMF entertainment. So come on out and enjoy the beautiful weather, good food and great performances.